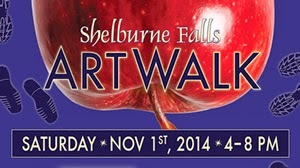 Shelburne Falls Art Walk is this Saturday - November 1st starting at 4:00 p.m. Experience the Art Walk in the charming Village of Shelburne Falls and follow the "decorated shoes" throughout the Village. Mingle with local artists, view demonstrations, enjoy live music, participate in community art projects, and ride Trolley No.10. Perfect time to get a jump start on your holiday shopping! !